The Sacramento, CA suburb of Elk Grove is home to a large Sikh community that, in 2011, mourned the loss of two grandfathers that were gunned down by an unknown shooter. A year later, a white supremacist walked into the Sikh Temple of Wisconsin and opened fire, killing six worshipers and leaving a police lieutenant wounded. This 2012 attack in Oak Creek, WI is the focus of our film, Waking in Oak Creek, detailing the community’s response to one of the deadliest hate crime attacks in recent U.S. history. We brought Oak Creek’s story to the California State Capitol Theater in Sacramento in August, bridging these two communities' stories of crisis, loss and healing. 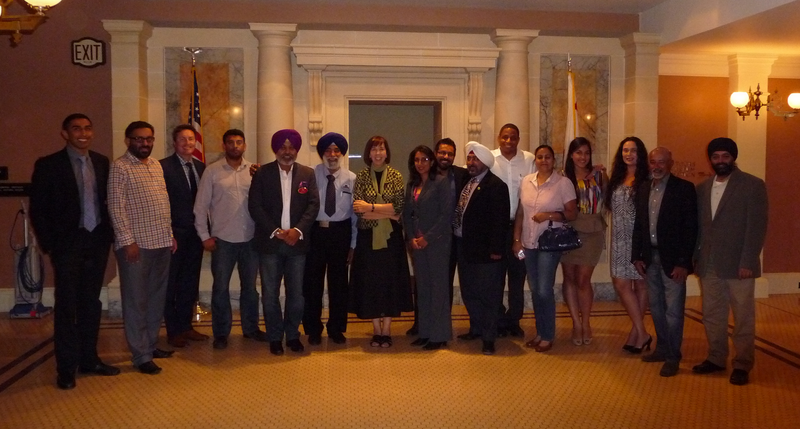 At the Sacramento screening, many attendees were Sikh leaders who pledged to take the film into the broader community. Inderjit Kallirai, a local leader in the Sacramento region, organized the event. The screening was co-sponsored by California State Assembly Members Richard Pan and Tim Donnelly, who presented a resolution to Not In Our Town. Also in attendance were representatives from the State District Attorney's office and Sacramento County Sheriff’s Department. Curating Wear a Turban exhibits on local campuses, where Sikh students can help others to understand the Sikh faith. One leader suggested that it was important for Sikh leaders to engage when other groups became targets of hate, to build solidarity and allies. To bring Waking in Oak Creek to your town, request a free screening DVD here.